The pros and cons for each set are listed out in bullet point format. What is Bluetooth Hearing Protection? What is Noise Reduction Rating (NRR) and why is it Important? Bluetooth hearing protection is a set of protective earmuffs that use Bluetooth technology to stream audio from any Bluetooth connected device. You can stream audio to your Bluetooth earmuffs from your iPhone, iPod, iPad, Android phone, tablet, or almost any other device available today. You can listen to any digital media including internet radio (Pandora, Spotify, etc. ), iTunes, MP3’s, podcasts, and audiobooks. Many models also allow you to listen to AM/FM radio through a built in receiver. This all happens wirelessly with no cords getting in the way. The 3M WorkTunes Bluetooth hearing protection headphones is the best option for homeowners or those who occasionally need hearing protection. Priced at well under $100, they are a great Bluetooth hearing protection option for light jobs such as mowing your lawn, working in your shop, or even going to a NASCAR race. With a Noise Reduction Rating (NRR) of 24 dB, they offer a similar amount of noise protection that you would expect from other high quality earmuffs. A lawn mower emits noise at a rate of about 100 dB. With these earmuffs, that noise may be reduced to 76 dB, or about the same level as a vacuum cleaner. 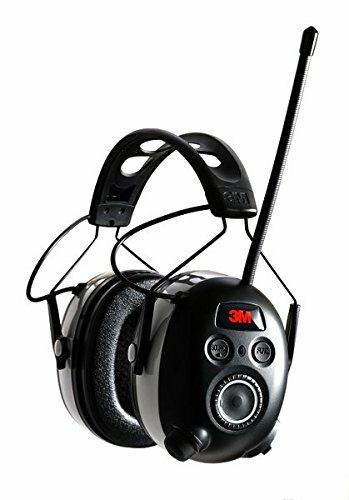 The 3M WorkTunes Bluetooth earmuff is compatible with your iPhone, Android phone, iPod, MP3 player, and any other device that has Bluetooth technology. Almost every modern device, including your smartphone, is compatible and will work with this headset. Through Bluetooth technology, you can wirelessly stream audio from your phone or other device to the headset. No cords or wires to deal with. This means you can listen to music from the internet or any MP3’s or podcasts you have downloaded. In addition to Bluetooth, this set features a built in AM/FM radio. If you just want to listen to regular radio, you can do that with this set. You can save up to 50 stations as presets. The radio functionality is especially helpful if you are attending a sporting event such as a football game or NASCAR race. You can watch the race or game while listening to the commentary via radio. Size. They are adjustable and will fit over a hat or a large head. Comfort. They are comfortable to wear for hours at a time. Wired and wireless options. The idea behind Bluetooth earmuffs is to eliminate cords. However, if you have a device that is not Bluetooth enabled you need to connect your device with a wire. This Bluetooth earmuff has the 3.5mm jack included to connect non-Bluetooth enabled devices such as a 2-way radio. Long battery life. With a premium set of batteries, you can listen to music for about 80 hours without changing them out. Voice assist. When you change the radio station, there is a “voice” alerting you to what station it has changed to. This feature allows you to know what radio station you are on without having to take the headphones off. The voice assist feature can be turned off if you wish. Reception. AM/FM radio reception of the newer model is much improved over the older versions. You can also save up to 50 stations as presets. Throttled volume. While listening to music, the music is limited to 82 decibels entering your ear. This is a safety measure put in place to protect your hearing. Auto shut-off. After two hours of inactivity the unit will automatically shut down. This is a good feature because it will save your batteries in the event you accidentally leave it on. The voice assist feature will alert you that it is about to shut off. All you have to do is turn the tuning knob forward one click and then back to keep it going. Indoor reception. The newer models of the 3M WorkTunes earmuffs have better reception than the previous versions. However, the reception indoors may not be as good as the reception you get outdoors, especially if you live an extended distance away from the radio tower. The radio reception does not play a factor in Bluetooth connectivity to your smartphone or other device. They slide up and down easily. Once you have them adjusted to fit your head, you do not want them to move. They are a bit loose and you may find yourself having to adjust them a few times per day. Durability. They are not built with the type of plastic you would find in a safety helmet. They are ok if you are careful with them and are not doing any kind of heavy work. However, if you expect to drop them and treat them rough they may crack. The battery case pops open. The battery case tends to pop open easily. A quick fix is putting a piece of electrical tape over the cover to ensure it stays closed while you are working. Cannot answer calls. There is no microphone to speak into so you cannot answer calls. When you are streaming via Bluetooth and a call comes in, the music will turn off. That is the best way to know you have an incoming call. You will need to remove the earmuffs in order to take the call. Not waterproof. They are not waterproof; however, they are designed to withstand moisture as a result of sweating and a light rain shower. If you have any problems or questions about the 3M Bluetooth earmuffs you can call 3M’s technical services department at 800-494-3552. You should also view 3M’s safety site for additional information about their Bluetooth hearing protection. Note: If you need a set of Bluetooth earmuffs for work every day, consider the 3M Peltor WS 100. They are higher end Bluetooth earmuffs (also more expensive) and are geared more towards those who work in a manufacturing facility, construction, or landscaping (equipment operators) every day. The Ion Audio Tough Sounds are a great option for Bluetooth hearing protection. This pair is our runner up for the best Bluetooth hearing protection for homeowners. They fall just behind the 3M WorkTunes model. They have a built in AM/FM radio and you can connect your smartphone or any other Bluetooth enabled device to it. This means that you can stream your favorite internet radio app, such as Pandora, or listen to a podcast while you work. If streaming via Bluetooth, you can skip tracks, adjust the volume, etc. through the headphones and do not have to take your phone out of your pocket. An added bonus with this set of Bluetooth earmuffs is that you can answer a phone call without taking them off. This is especially convenient if you need to continue working while you talk. It also features a rechargeable lithium ion battery which means there is no need to buy additional disposable batteries when the charge runs out. Can answer calls. These Bluetooth earmuffs have a built in microphone which allows you to answer calls via Bluetooth connection. You can have the entire phone conversation without removing your earmuffs. Rechargeable battery. Features an internal lithium ion battery which can hold a charge for around 20 hours before recharging is necessary. No disposable batteries required! NRR protection level. 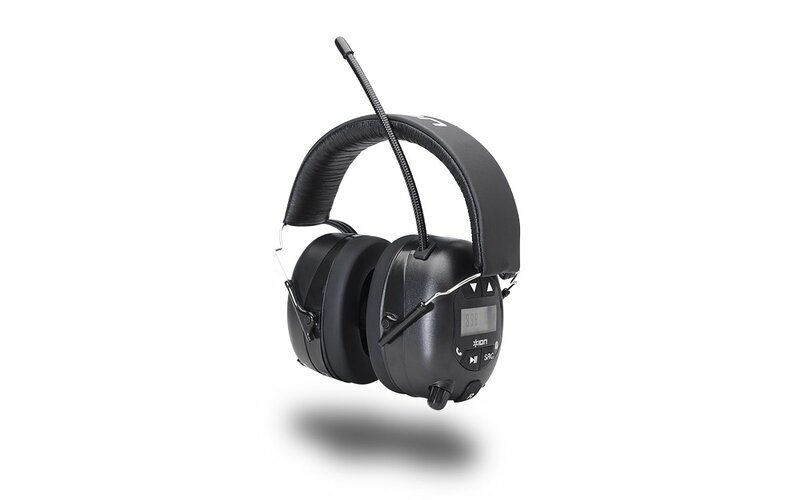 This pair of Bluetooth earmuffs has a high level of hearing protection with a rating of 25 NRR. This means a lawnmower emitting noise at a rate of 100 decibels will be reduced to 75 decibels, or about the same level of noise as a vacuum cleaner. Presets. You have the ability to set up to 20 radio presets. Auxiliary jack. This unit includes an auxiliary jack in case you decide you want to use a wire to connect your device. This comes in handy if you would like to connect a 2-way radio that does not have Bluetooth technology. The wiring is sold separately. Sound level. The sound level is low. If you are working in a loud environment, the hearing protection is great, but there is just enough outside noise to make hearing the audio difficult. This is a feature designed to protect your hearing by limiting the decibel level entering your ear, but you may find that it is a bit too low. Charger. It has a rechargeable battery which is a good thing. However, it only comes with a USB charger. If you want a charger to plug into the wall, you will need to purchase it separately. You may be able to get by with your phone charger if it has a USB slot. Otherwise, you can charge it through the USB port on your computer. Tight fit. If you have a larger head or plan to wear these over a hat, be aware that they may fit tighter than you would like. The 3M Peltor WS 100 Bluetooth earmuffs (model MT16H21FWS5UM580) are a great option for workers who need to communicate while on the job. 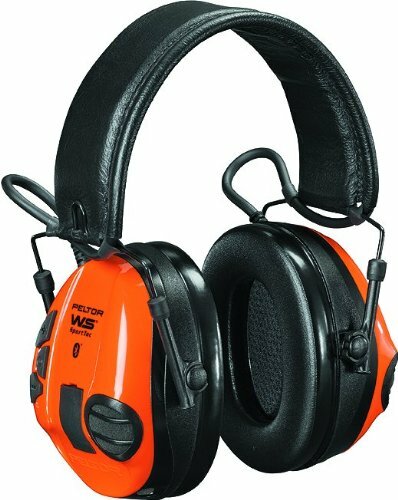 In fact, we picked this pair as the best Bluetooth hearing protection for workers who wear a pair of earmuffs every day. This set of Bluetooth earmuffs amplifies the sounds you want to hear and silences loud noises that could damage your hearing. They allow you to hear what someone else is saying while wearing the headset. They do not have to be speaking through the microphone; you can hear their spoken voice. This is possible through the sound amplification technology. You can turn the volume up or down depending on how loud you wish to hear outside sounds. You can also hear approaching vehicles with the earmuffs on. It blocks out high decibel sounds, such as machinery and equipment, and amplifies sounds such as speech. The loud noises are silenced because the earmuffs have an output limit of 82 dB. This means the maximum sound that is electronically transmitted through the earmuff is 82 dB. It includes a boom microphone which allows you to take calls while on the job. You can receive calls without removing the headset. The boom microphone allows you communicate with the person calling. You can receive calls through your phone without taking the headset off. With the Bluetooth technology, you can also stream audio wirelessly from your phone or other Bluetooth enabled device to the headset. You can listen to internet radio such as Pandora, and other media including podcasts. 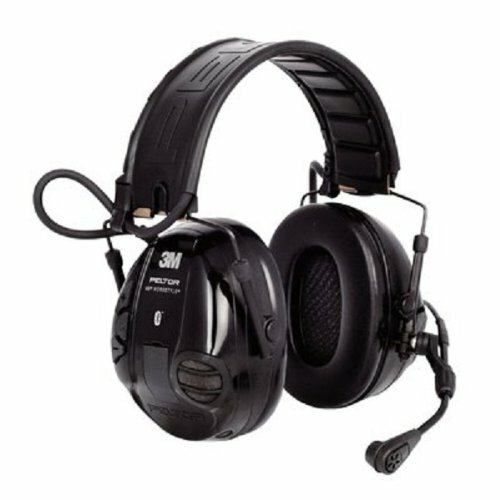 Overall, the 3M Peltor WS 100 Bluetooth earmuffs are a great option for workplace Bluetooth hearing protection. Communication. You are able to hear someone else speak in their natural voice (not through a microphone) while wearing the earmuffs. Outside sounds can be electronically transmitted up to 82 dB. The volume can be adjusted as needed. Phone calls. You can receive phone calls while connected to your phone via Bluetooth. There are buttons on the side of the headset that allow you to accept or reject a call. If you are listening to music, it will stop while the call is in session and resume when you hang up. Bluetooth range. The Bluetooth range is 30 feet between the earmuffs and the Bluetooth enabled device when there a walls present. You can pick up a signal over 100 feet if you are working in a plant where there are no walls, just open space. Wired connectivity. Wired connectivity is optional, but if needed, a 3.5mm auxiliary jack is on the headset. Wiring is included. This is helpful in the event you need to hook up a 2-way radio that does not have Bluetooth technology. Sound limiting. Includes sound limiting technology which limits media to 82 decibels. This blocks out loud noises and amplifies sounds such as speech and nearby vehicles. The volume can be adjusted up or down depending on how loud you want to hear outside sounds. Hard Hat compatible. You can wear these Bluetooth earmuffs with a hard hat. Comfortable. They are lightweight, weighing only 12.4 ounces and are comfortable enough to wear all day. No Antenna. There is no antenna to get in the way. Cost. They cost more than the 3M WorkTunes and the Ion Tough Sounds Bluetooth earmuffs we reviewed. However, they are geared towards workers who require the ability to communicate with each other while wearing the headset. If this is important to you, the price is worth it. Lower NRR. The noise reduction rating is lower than the 3M WorkTunes and Ion Tough Sounds Bluetooth hearing protection. No radio. There is no AM/FM radio built into this model. However, it does have Bluetooth so you can stream any type of sound you wish from your smartphone or any other Bluetooth enabled device. The 3M Peltor WS Tactical Sport (model MT16H21FWS5U-584) is the best Bluetooth hunting ear protection. They can amplify the sounds around you while help protect you from loud impulse noises such as a gunshot. The maximum sound that enters your ear electronically is 82 dB, or about as loud as a window AC unit. Since a gunshot is much louder than 82 dB, the earmuffs limit the electronic noise to 82 dB. This is not to be confused with the actual sound entering your ear. As with any hearing protection, that is dependent upon the NRR rating. The NRR rating is a standard measure of noise protection for all earmuffs. The NRR rating for this set is 20. If a gunshot is 130 decibels, this set will actually reduce the outside noise to 110 decibels. The maximum NRR rating for earmuffs on the market today is 31 decibels. If you think you do not need Bluetooth earmuffs for the sole purpose of hunting ear protection, keep in mind that they can serve other purposes as well. You may enjoy listening to music while you mow the yard or are on the job. You may need Bluetooth hearing protection while at a NASCAR race so you can block out the noise of the race and listen to a live stream through your phone. Why buy a separate set? With these you can use them for hunting ear protection as well as other activities where there are loud noises. Separate volume controls. There are two different volume settings. One for ambient, or outside noise, and a separate setting for the volume of your Bluetooth connected device. While hunting you can adjust the volume of the outside noise. This means you can amplify the sounds around you with the earmuffs on. You can hear the surrounding sounds better than you would without the earmuffs. At the same time, they help protect from impulse sounds, such as a gunshot, since the maximum level of noise that enters your ear electronically is 82 dB. A separate volume adjustment allows you to set the volume of the audio streaming through Bluetooth, such as Pandora or phone calls. Built in microphone. It is built with an embedded microphone which will allow you to receive calls and talk to the person on the other end. It does not come with the boom microphone like the one on the 3M Peltor WS 100 model. The boom microphone can be purchased separately if needed. Auxiliary jack. It comes with a 3.5mm auxiliary jack where you can plug in a 2-way radio or other device if needed. This is a good feature which allows you to connect devices that are not Bluetooth enabled. Rechargeable batteries. Two AAA batteries are required. It comes with the required rechargeable batteries as well as a charger. Two color shells. Two shells come with the unit, orange and green. The orange pair may help make you more visible while hunting. You can change the shell between orange and green as you like. No Antenna. There is no antenna to get in the way. However, there is no AM/FM radio either. Battery life. The rechargeable batteries that come with the Bluetooth earmuffs only last for about 12 hours per charge if Bluetooth is activated the entire time. You can purchase a set of premium batteries if you need the unit to last longer. Otherwise, you will need to recharge them often. Comfort. If you wear them for an extended period of time (more than 8 hours), they may start to become uncomfortable. Surrounding noise. I you work in a manufacturing or other facility where there are constant loud noises you may not be able to hear a person talking to you. They work great with impulse noises such as a gunshot while hunting; however the technology cannot distinguish a human voice from machinery running around you if you work in a plant. You can turn the volume down if you do not want to hear outside sounds electronically. Battery compartment. You may have to force the batteries into the compartment as they do not fit very well. Noise induced hearing loss (NIHL) is the second most self-reported workplace injury. This injury can be prevented by wearing the proper hearing protection. Exposing yourself to a high decibel noise environment can cause irreversible hearing damage. In fact, for workers, OSHA requires you to wear hearing protection if you are constantly exposed to more than 85 decibels for 8 hours per day. Noise is measured in decibels and the higher the decibel the louder the sound. Decibels are often abbreviated as “dB”. Anytime you are exposed to a high decibel noise environment, you should wear hearing protection. This includes working with equipment such as a lawn mower, tractor, chainsaw, woodworking equipment, or working in many manufacturing facilities. According to Purdue University, lawnmower noise is 100 decibels. At 100 decibels serious hearing damage can occur after only 2 hours. Also ranking in at 100 decibels or more are motorcycles, tractors, boat motors, and jackhammers. Below is a table of noise levels measured in decibels by source. You should consider wearing hearing protection in loud environments for your own well-being. Earmuffs are worth the small price to protect your hearing, and Bluetooth earmuffs can greatly enhance your experience while wearing them. Your hearing is worth protecting! Hearing protection should be used anytime noise is consistently over 85 decibels. Studies have shown at this level, chronic hearing loss can occur. This is the level where OSHA requires all employees to wear hearing protection when exposed for 8 hours. Below is a chart for OSHA’s permissible noise exposure levels in decibels, by hour. At work. As the chart indicates above, any worker exposed to more than 85 decibels for duration of eight hours is required to wear hearing protection. Occupations that require hearing protection include landscaping (lawn mower, leaf blower, weed wacker, and other equipment), construction, and manufacturing. At home. If you are homeowner, a set of hearing protection earmuffs is essential. Whether mowing your yard, working in your shop, or on your tractor, you should always wear hearing protection. Sporting Events. These headphones work great at loud sporting events such as a NASCAR race or NFL game. You can tune into the radio station broadcasting the game while watching it live. It is a great experience. Running a chainsaw. You can use Bluetooth earmuffs while working with a chainsaw. However, we advise you to be extremely careful when doing so. You do not want to be distracted while working with a chainsaw or any other equipment. Hunting. Bluetooth hearing protection that amplifies sounds around you is a great option for hunting ear protection. Please see our 3M Peltor WS Tactical Sport review for the best Bluetooth earmuffs for hunting ear protection. These earmuffs limit loud sounds that enter your ear electronically to 82 decibels. At the same time, the sounds around you can be amplified based on volume settings you determine. For hunters, this provides the best of both worlds – the soft noise around you is amplified up to 82 dB while providing protection from the gunshot at the same time. As point of reference, 82 dB is about as loud as a window AC unit. Most of the electronic earmuffs on the market today are wired earmuffs. However, if you want to connect to your smartphone to listen to internet radio (Pandora, Spotify, etc. ), podcasts, audiobooks, etc. you would need to run a physical wire from the device’s output jack to the earmuffs. A physical wire can be very inconvenient and can even be a safety hazard while working. Bluetooth hearing protection is the answer to this problem. Bluetooth earmuffs are wireless. You can wirelessly connect your phone or Bluetooth enabled MP3 player to the earmuffs. This means no cords to get in the way and reduces the risk of an accident while you are getting work done. Noise Reduction Rating, or NRR, is a measure of how much noise a piece of hearing protection can eliminate. The highest rated earmuffs available on the market today are 31 NRR and the highest rated earplugs are 33 NRR. The NRR is important because it is used to determine your “protected exposure” while wearing your Bluetooth earmuffs. The average riding lawnmower emits noise at a rate of 100 decibels. The NRR rating on the 3M WorkTunes Bluetooth Hearing Protection is 24 decibels. This means that your “protected exposure” is 76 decibels (100 – 24 = 76), or about as loud as an office environment. Bluetooth earmuffs can offer similar hearing protection as other quality earmuffs while enhancing the experience of wearing them. If you enjoy listening to music, talk radio, or sporting events while you work, Bluetooth earmuffs will get the job done. We recommend buying a set. They are worth every penny.